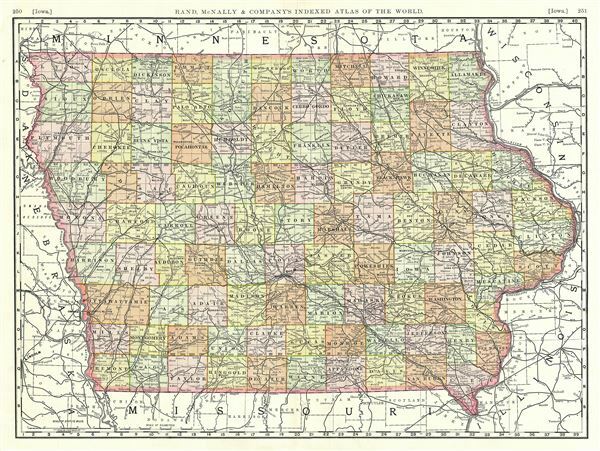 This is a beautiful example of Rand McNally and Company's 1889 map of Iowa. It covers the state of Iowa along with parts of adjacent Wisconsin, Illinois, Missouri, Nebraska, Minnesota and South Dakota. Color coded according to counties, the map notes numerous cities, towns, rivers, railroads and other topographical details. This map was issued as plate nos. 250 and 251 in the 1893 edition of Rand McNally and Company's Indexed Atlas of the World- possibly the finest atlas Rand McNally ever issued. Very good. Original centerfold exhibits minor wear. Minor verso repair in Putnam county, Missouri. Text on verso. Rumsey 3565.125 (1897 edition). Philips (atlases) 1026 (1898 edition).